We have the best forecast possible for the Easter weekend and I hope you all find time to get out and enjoy it with your equine partners. Tonight, Thursday, sees us at Greenacres Equestrian in Convoy to enjoy the last of our session of gridwork lessons under the tutelage of Alison Higgins. These lessons have been very enjoyable and beneficial for all the horses and riders attending. Easter Monday 22nd April Training Show @ Lenamore Stables, : commencing at 12 midday. Details are available on the flyer below for our annual Audrey Jacob Team Challenge. This very special show, held indoors and with free stabling available for all competitors, is held in memory of a very special lady, for whom the AIRC ethos of enjoying equestrian activities was most important. The camaraderie and craic, which are an inherent aspect of this show, are traits which Audrey held very dear. These, combined with a deep and genuine care for our equine team mates, were Audreys trade marks and we’ll be delighted to welcome as many as possible to keep the spirit of riding club alive and kicking on the 28th of April. Sunday’s final at Templemore was every bit as exciting for all the competitors as was anticipated. A trait of this years league has been the almost non-existent participation at primary level, and this trend continued at the final with just Ellen Rogers on Rocco tackling the 70cm course and claiming the red rosette. The AP class was well supported and saw some very hot competition result in Brenda Burke claiming the winners position on the podium with her homebred Bonnie Mismatch. 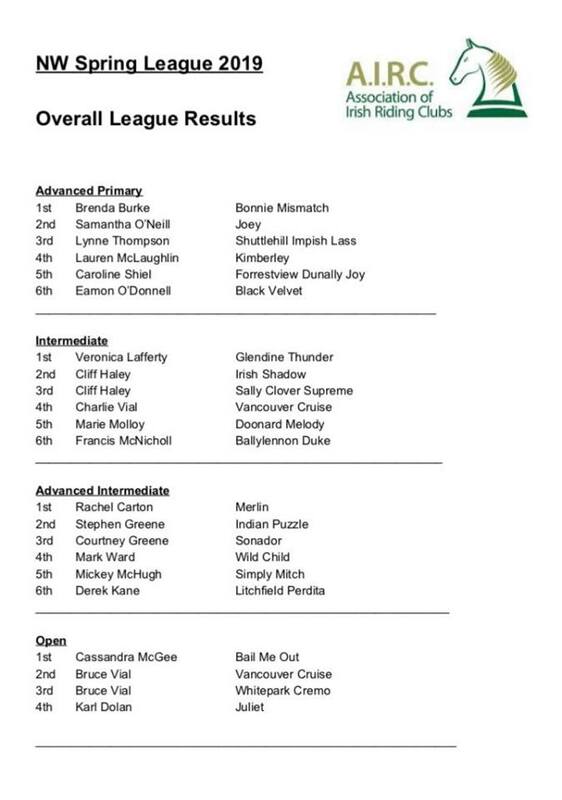 This enabled Brenda to bag enough points to overtake long time league leader Lauren McLaughlin and claim the overall first prize in the league. This is especially fulfilling for someone who has brought on a homebred horse from scratch. Despite not placing at the final Lauren was still able to hold onto fourth place in the league, behind Samantha O’Neill and Lynne Thompson. The intermediate division has traditionally been one of the largest and most competitive classes. Veronica Lafferty took no prisoners as she set a blistering pace on the gallant Glendine Thunder in the jump-off. Cliff Haley gave chase on both Irish Shadow and Sally Clover Supreme but had to settle for second and third positions. Charlie Vial, Marie Molloy and the ever-improving Francis and Ballylennon Duke, aka Bonzo, filled the remaining positions. The advanced intermediate class provided a cracking jump-off when all four competitors were clear in the first round. Rachel went first on Merlin and got a lucky clear in a good time of 31.62. Mark Ward had an uncharacteristic stop at the first with Wild Child and Coutney Greene gave a textbook example of how to cut corners on Sonador but unfortunately took one pole down en route. Stephen Greene had it all to play for when he rode into the ring on the enthusiastic Indian Puzzle and he gave it lallty, setting the mare alight from the start. The clocks stopped for him on 31.67, a mere 0.05 seconds behind Rachel. This left Rachel with a secure margin in first place overall. Cassandra McGee rode a beautiful clear on Bail Me Out in the open class. The clear was enough to beat Bruce Vial whose mounts each knocked a pole, leaving Cassandra to claim the league red rosette. The league was very well run and I think the addition of new venues was certainly a help in shaking things up, though perhaps the weather gods weren’t always on our side for the outdoor venues. Brenda Burke did a great job as always in her prize shopping, ensuring an interesting and useful selection of prizes for the winners. 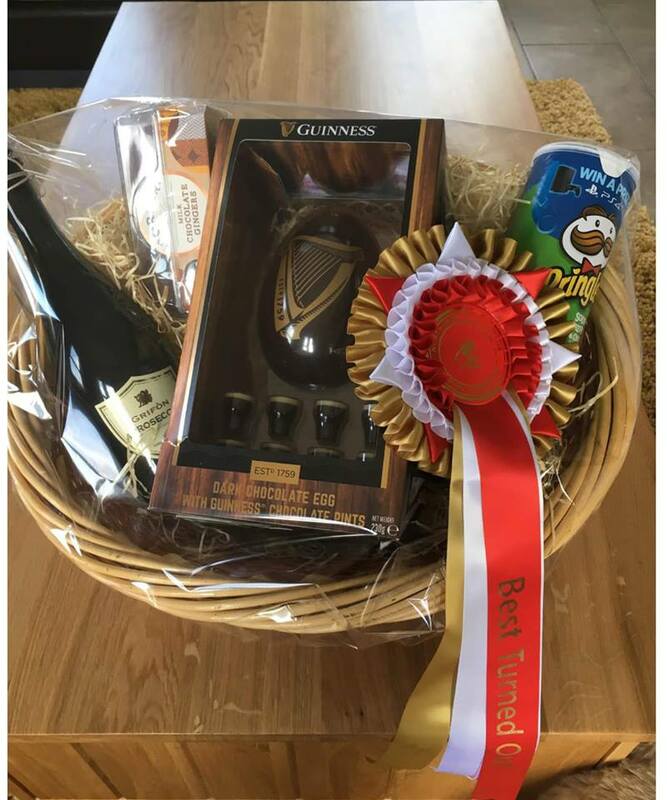 Courtney Greene benefited from Brenda’s shopping prowess when she was awarded the smashing hamper as a prize for her immaculate turnout at the final. It’s no easy feat to present a white-grey as clean as Sonador was on Sunday. Thanks as always must go to the fleets of volunteers who ran each leg, as well as the course builders Seamus McCaffrey and Alex Deane, and judge Cormac McCormac. 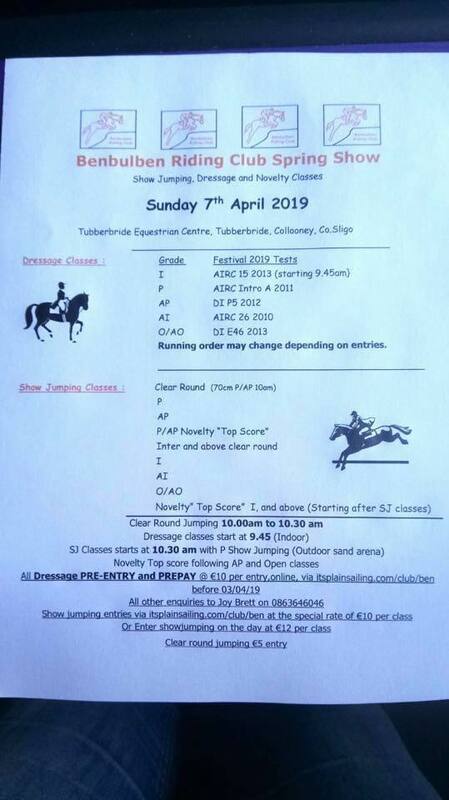 For those of you who want to keep up (or start up) your competitive careers the Benbulben club is running a showjumping and dressage show in Tubberbride on Sunday 7th April. Details on the flyer below. If you feel that some sociable training would fit you better than the competitive arena you’ll be glad to hear we have a series of Friday evening lessons coming up. Details are being finalised at the moment but if you have a preference for either flatwork or gridwork please let Hazel know asap. An inter-club consultation has resulted in the league rules being amended to take into account the loss of a leg. In order to be eligible for prizes a rider must have ridden in two of the four legs, whilst it is now a competitors best three scores which are counted. This leaves almost everybody still in the running for prizes at the final and should guarantee full attendance at what promises to be the most nail biting day of jumping for a long time. Those who want to be truly competitive on the 24th can avail of a chance to show their steeds the jumps this Saturday at Templemore Equestrian Centre’s St Patrick’s Day show. This is always a great day and is the biggest show of the year at the venue. Details are on the flyer below. Tomorrow, Sunday 10th’s, leg of the north west riding clubs spring league has been cancelled. The weather forecast for the Saturday night is far from favorable and the roads from the west of the county are likely to be unsafe for travelling with horses. This gives us all an opportunity to sit back and put our feet up for the day. It also changes the dynamic of the league slightly with competitors no longer having a score to drop over the league, as the rules state that the best four scores are counted. The double points awarded at the final means that most league tables are still very open and Sunday 24th should prove to be a very exciting final in Templemore. As things stand I believe Eimear Carlin is the only competitor who can be sure of claiming first place, though she must take part at the final in order to qualify for prizes. This is down to the rule stating that riders must take part in at least three of the five shows to be eligible for prizes. In the advanced primary class we have only Suzanne representing us and with tomorrow’s leg cancelled she can no longer fulfill the criteria for riding at three shows. Lauren McLaughlin leads this division but is vulnerable to being beaten by seven other riders. Anyone who has three or more points, and has ridden at two or more legs of the league, could beat her if they won on the 24th and Lauren didn’t place. The intermediate division has Veronica Lafferty in pole position, with five riders capable of beating her to the final red rosette. Our own Cliff Haley, riding Irish Shadow, and Tirconails Charlie Vial, are tying for second place with ten points apiece, while Cliff also holds third position on Sally Clover Supreme, on nine points. Marina is our other joker in the pack at this level. Herself and Jenny are still in the running with six points. A win on the 24th would shoot her up to twenty points, just enough to beat Veronica if things went uncharacteristically badly for Veronica at the final. Francis and Bonzo are in with a chance of tying for second place…exciting times. The cancellation of tomorrow’s leg denies some advanced intermediate riders the opportunity to close the gap on Rachel and Merlin, who sit on the maximum available 21 points going into the final. The Gaeltacht’s Mickey McHugh and Tirconail’s dream team of Stephen and Courtney Greene, are all in a position to beat Rachel in the final, with Mark Ward and Derek Kane still in the running for places on the podium. The open class truly is open. The only person on the league table who is not in a position to win the league is Tara Fergus Sheridan, who has been denied the chance to take part in the necessary three shows by the cancellation of tomorrow’s leg. Cassandra McGee and Bruce Vial are tying for first place with thirteen points apiece. The 24th certainly looks like it will be an exciting day and should be well supported. Templemore Equestrian Centre is running it’s annual St. Patricks day show for horses on Saturday 18th, followed on Monday 18th by a pony show, so the arena and jumps will be in tip-top order. Remember there is a prize for best turned out at the final so it’ll be worth getting up half an hour earlier to get those plaits in (or at the very least scrub the dung off the legs and brush out the tail!). Also there is a place in a draw for a fuel voucher for anyone who has attended all legs of the league. Currently there are twelve people with a place in this hat. Roll on the 24th. Our club has an excellent record at these championships and the course at Annaharvey is definitely a very good track so the very best of luck to anyone travelling. The third leg of the North West Riding Clubs spring league took place in Greenacres Equestrian Centre on Sunday 3rd March. The day was a lovely bright day, though cool, and the classes were well supported. Stracomer riding club officiated for the day and ran the operation like clockwork, ensuring a cheerful atmosphere and efficient class changes. It was great to meet Tanya and young Alex, as well as Erica and Dave with Georgia, and to see the future club members being introduced to the game at an early age. Suzanne represented the club at the advanced primary level, with her old campaigner Jack showing that he hasn’t forgotten some of his old tricks despite his advancing years. Our intermediates were out in force, with Cliff in flying form on both Shyla and Shadow. Shadow showed huge honesty in the jump-off, tackling an oxer off an unbelievably tight turn and would have clinched a well earned win if the dratted back pole had stuck to its job and stayed in the cups. Francis and Bonzo continue to progress and tackled the challenging course with aplomb. Marina put in a flying appearance with London Jen, who made the jumps look extremely small as she popped around. In the advanced intermediate class Merlin hitched up the straps of his big boy trousers and pulled off the only clear of the class, despite his rider definitely being a bit out of practice when it comes to seeing a stride! This was the pairs third win in as many shows but with double points on offer at the final the league title is still very much up for grabs. 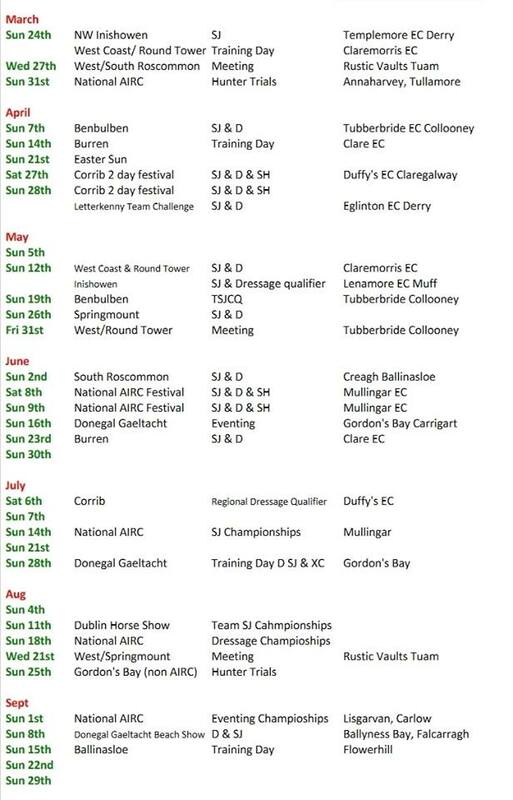 Next sunday sees the league move to the scenic venue of Gordon’s Bay Equestrian, before taking a short break for Paddy’s Day and returning to Templemore Equestrian for the final on the 24th (just before Brexit kicks in and Donegal is turned into an island). Life beyond the showjumping league continues to exist. 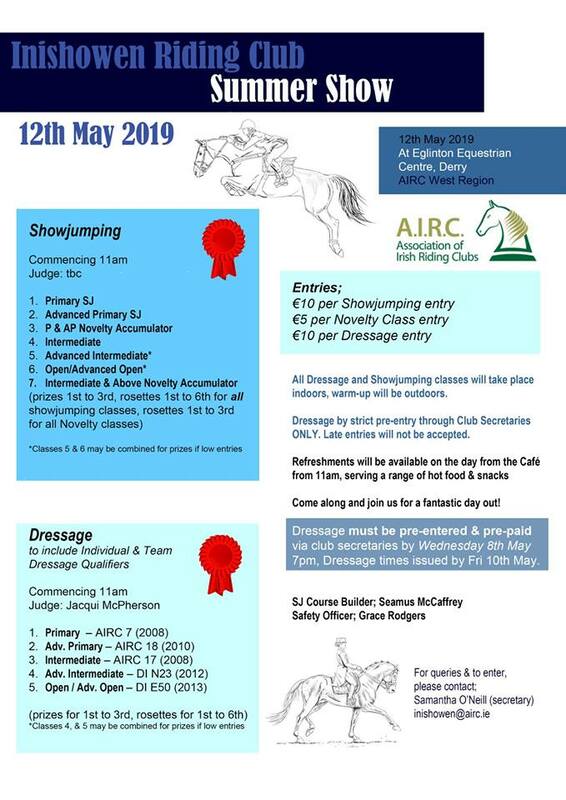 Cliff has organised a series of flatwork/dressage lessons with Mary Devine on a friday evening and these are an ideal opportunity to polish your performance in advance of the Audrey Jacob team challenge and the annual dressage championship qualifiers. Cormac and Jenny have been undertaking child protection training in order to ensure the club stays on the right side of the red tape. The inter-club meeting held in the Glencar Inn was a peaceful affair by all accounts. The decision was made not to run a 2-phase league this year. Individual clubs may run events incorporating cross country but they will not be part of a specific league. Tirconaill riding club is running a charity rideout from Harveys Point Hotel on Monday 3rd June (the bank holiday). This should be a very sociable affair and is in a beautiful setting. Definitely a date for your diary. Finally our own club meeting will be on Monday 1st April and we’ll be organising the team challenge, which is one of our flagship events and is always a very popular outing for all.